The 2016 U.S. presidential election had a significant impact on markets, in part due to the surprise of the results. As markets have evolved out of an unusually low volatility period, many futures markets have seen the return of pre-2017-style volatility in response to policy changes and geopolitical turmoil. The risks posed by these events have had varying impacts on individual markets, but traders across all markets and regions sought relevant futures and options to limit their impact. In many countries, elections can be significant events, creating volatility or uncertainty if the results differ from expectations. We saw this play out across several markets in November 2016, as the results of the U.S. presidential election came in throughout the Nov. 9 trading session. To a lesser degree, overnight trading increased over the average trading day in each of the two elections prior (2012, 2014). In the 2014 midterms, for example, overnight trading on CME Group markets was at 3.2 million, about 24 percent of overall daily volume (vs. 20 percent average). In 2016, overnight volume moved to 20.5 million and about 45 percent of overall daily volume (vs. 21 percent average). As we wait to see how markets respond to the U.S. midterm election results, it's worth going back two years to revisit how markets performed in 2016. The results of the election surprised most experts and defied probability models even as polls had tightened in the weeks leading up to the election on Nov. 8. Markets in general were caught on the back foot, leading to significant movements across equities and rates as results came in the evening of Nov. 8 and into the early morning hours of Nov. 9, 2016. As markets responded to the news of the change in administration, many staples in the futures space saw dramatic moves that were largely reversed by the end of the U.S. trading day. This reflected markets taking in the impact of the electoral news and adjusting their expectations of the new administration. This dynamic response to the unexpected results highlights the flexibility and reliability of futures markets for participants seeking to hedge risk against a changing news cycle. Some of the most visible futures markets saw record volumes and tight bid/ask spreads throughout the trading day, during U.S. hours and beyond. Markets reeled in response to the unexpected results of the 2016 presidential election, with E-mini S&P 500 futures falling more than 6 percent before ending the day higher. While the drop in price was in response to the shock of the news, equities ultimately recovered as traders considered the potential for a business-friendly administration and promised tax cuts. Volumes were elevated throughout the day as traders worked to protect their exposure. It is worth noting, the election in 2016 occurred during a very different volatility regime than markets are currently facing, which likely contributed to how markets responded to the surprising outcome. 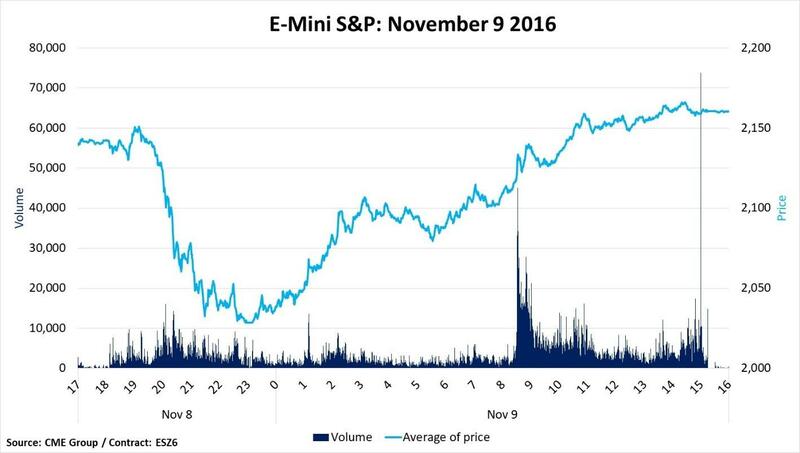 The implied volatility in the E-mini S&P 500 for the months leading up to Nov. 8, 2016 were fairly stable, between 0.10 - 0.15. The same months in 2018 highlight recent changes in overall volatility dynamics, with implied volatility topping 0.20. 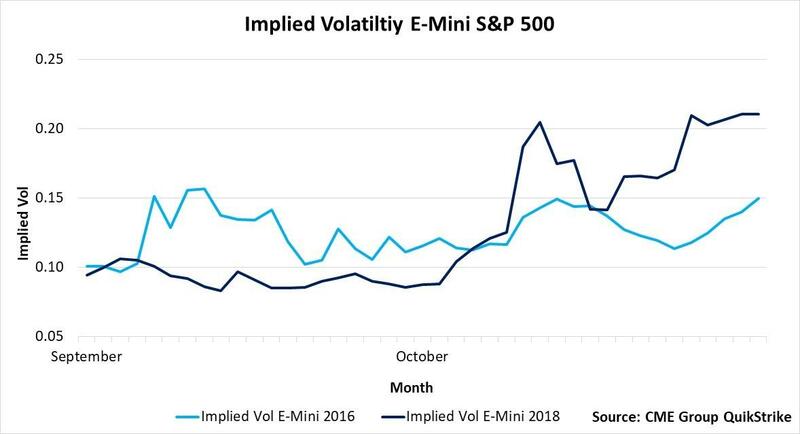 In all, implied volatility spanned about 0.06 over the two months in 2016, while the same period in 2018 saw implied volatility swing by nearly 0.13. 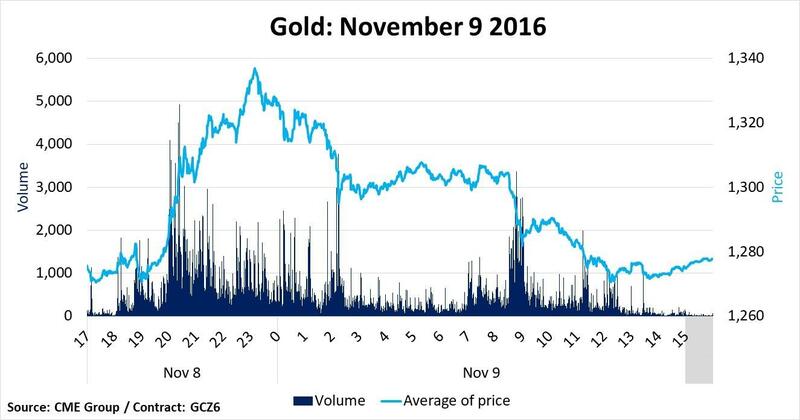 A perennial favorite during times of uncertainty, the response from gold to the 2016 presidential election results in terms of price and volume was almost exactly the opposite to S&P 500's movement for the day. As news built that the election result may be unexpected, gold prices and volume ticked up, with prices spiking 5 percent higher. This was the result of traders flocking to the security of gold as the news pointed towards potential volatility in the markets. However, as participants began to consider the policy positions of the incoming administration, the gold price reverted to close nearly unchanged on Nov. 9. The review of activity in these markets in November 2016 tells us little for certain about 2018 and future elections, but it does show two things: 1) Pre-election expectations matter and 2) You can never be certain how markets will respond.